Australian FM visits Tehran in first for over a decade, makes unspecified deal to get help tracking Aussie ISIS recruits. Australian Foreign Minister Julie Bishop announced on Monday after a visit to Tehran that her country and Iran will share intelligence to track foreign jihadists fighting for Islamic State (ISIS) in Iraq. The intelligence sharing will be informal according to Bishop, who met with Iranian Foreign Minister Javad Zarif, President Hassan Rouhani, and Ali Akbar Velayati, who is the foreign affairs adviser to Iranian Supreme Leader Ayatollah Ali Khamenei, reports AFP. 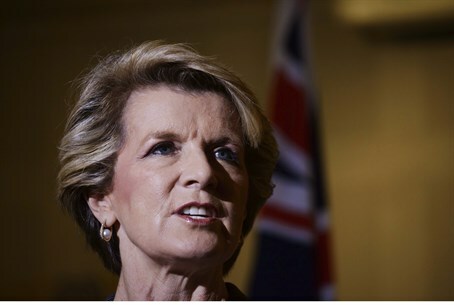 Her visit was the first by an Australian minister in over a decade, and signifies further rapprochement between the Islamic regime and world powers despite its controversial nuclear program and active support for terrorist organizations around the globe. Signs of that rapprochement were seen in letters written by US President Barack Obama to Khamenei late last year, urging Iran to cooperate with the US against ISIS on the one hand and reach a nuclear deal on the other. "We have a common purpose with Iran in defeating Daesh and helping the Iraqi government," Bishop told the Australian Broadcasting Corporation, referencing ISIS by an Arabic acronym. Pictures from the visit showed Bishop with a black Muslim head scarf covering her hair while meeting with a laughing Rouhani. "During my discussions with the national leadership here, it was agreed that we could share intelligence, particularly on the foreign terrorist fighters from Australia who are taking part in this conflict in Iraq." More than 100 Australians - notable among them 18-year-old suicide bomber Jake Bilardi - have gone to join the jihadists in Iraq and Syria, raising fears that returning terrorists may conduct attacks in Australia. Those fears were illustrated on Saturday, when two men in Melbourne were arrested planning an ISIS-inspired attack on Anzac Day celebrations this Saturday, which is Australia and New Zealand's memorial day. "I believe that Iran has information that we would seek and they were very agreeable to share that information with us," Bishop said. She didn't describe what Australia agreed to give Iran in return, saying "I won't go into detail of our intelligence-sharing arrangements." "But obviously if Iran has information that will be of interest to us, if we have information that would be of interest to them, in pursuing our common purpose of defeating Daesh, then that is an appropriate exchange." Australia is part of the US-led coalition battling ISIS in Iraq, and last week deployed 330 troops to join its forces there and train local soldiers. Bishop said she stressed that their role is limited to training local soldiers in her meetings in Tehran. "I don't want there to be any misunderstanding, any miscalculation or any misjudgement, and I made that point very clearly to each one of the leaders that I met," she said. "They must have an understanding of our role, because there's a lot of misinformation that is flowing around Iraq and we know that Daesh is very good at propaganda." Iran has been taking a key role in the fight against ISIS, funding and leading Shi'ite militias to both fight the radical Sunni group and at the same time extend its influence in its neighboring state of Iraq. The Islamic regime has likewise gained control in Lebanon via its terror proxy of Hezbollah, in Yemen through its Houthi Shi'ite rebels, and in Syria both through its own troops and Hezbollah.